Ritengo opportuno pubblicare il testo originale (nella versione inglese, così da renderne più semplice la comprensione) della Risoluzione che il Parlamento serbo ha approvato lo scorso 31 marzo in relazione ai tragici fatti avvenuti nella città bosniaca di Srebrenica. Pur trattandosi di un testo che è frutto del compromesso tra le diversi posizioni politiche rappresentate in seno alla Skupstina, rappresenta comunque un passaggio di elevata portata storica e simbolica. Ma per i commenti c'è tempo. The National Assembly of the Republic of Serbia most severely condemns the crime committed against the Bosnian population in Srebrenica in July 1995 in the manner established by the ruling of the International Court of Justice, as well as all the social and political processes and incidents that led to the creation of awareness that the realisation of personal national goals can be reached through the use of armed force and physical violence against members of other nations and religions, extending on the occasion condolences and apologies to the families of the victims that everything possible had not been done to prevent the tragedy. The National Assembly of the Republic of Serbia provides full support to the work of the state authorities in charge of processing war criminals and successful completion of the cooperation with the International Criminal Tribunal for the Former Yugoslavia, in which the detection and arrest of Ratko Mladic for the purpose of standing trial before the International Criminal Tribunal for the Former Yugoslavia is particularly significant. 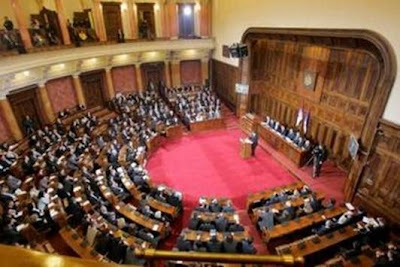 The National Assembly of the Republic of Serbia calls upon all the former conflicting sides in Bosnia and Herzegovina, as well as in the other states of the former Yugoslavia, to continue the process of reconciliation and strengthening of the conditions for common life based on national equality and full observance of human and minority rights and freedoms so that the committed crimes would never be repeated. The National Assembly of the Republic of Serbia expresses the expectation that the highest authorities of other states on the territory of the former Yugoslavia would also condemn the crimes committed against the members of the Serbian people in this manner, as well as extend condolences and apologies to the families of the Serbian victims. This declaration is to be published in the Official Gazette of the Republic of Serbia.